Given the current state of the economy, you might be asking yourself if right now is the right time to be investing in real estate. With the third edition of Getting Started in Real Estate Investing as your guide, you'll quickly discover how a combination of commitment and caution can help you make it in today's market. Designed for investors who want to get started in real estate, but don't know where to begin, this reliable resource will help you break into this fast-moving field and build equity the right way. Getting Started in Real Estate Investing, Third Edition addresses everything from selecting the right properties and becoming a landlord to using the proper tax strategies and finding the right professionals to work with. It also outlines issues you must be aware of in light of recent events, including the best ways to finance your real estate investments, considering the status of mortgage financing, and new requirements that may be thrown at borrowers. 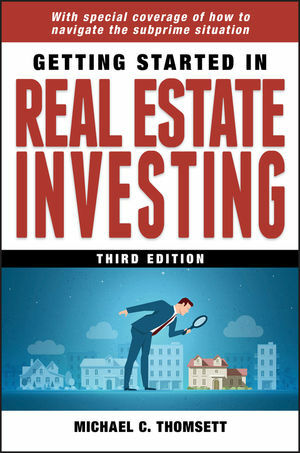 Written in a straightforward and accessible stylewith a focus on residential and multifamily propertiesGetting Started in Real Estate Investing, Third Edition also contains helpful information that will allow you to analyze your financial ability to buy and hold real estate as well as avoid potential pitfalls. In order to excel in real estate investing, you need to start by defining what you want to do and how much risk you can afford. But ultimately, success depends on making informed decisions about where and when to invest, and Getting Started in Real Estate Investing, Third Edition gives you the tools to achieve these goalseven under the most difficult market conditions.